Gives encouragement to everyone who has ever faced a situation that felt insurmountable. By seeking God's answer, even the most complex problems can be solved once and for all. Kerry L. Skinner, D.Min., has served in pastoral roles for more than thirty years with an emphasis in Christian discipleship and pastoral counseling. He was mentored by the late Dr. Henry Brandt and also served as associate to Dr. Henry Blackaby (co-author of Experiencing God) in the office of Prayer, Revival, and Spiritual Awakening for the North American Mission Board. Today, Dr. Skinner is senior associate pastor of Cottage Hill Baptist Church in Mobile, Alabama. 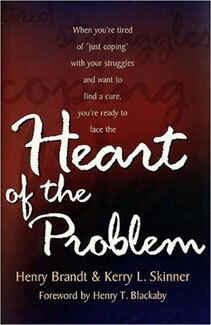 His books with Brandt include The Heart of the Problem and Marriage God's Way, an ECPA Gold Medallion Award finalist. Dr. Skinner and his wife, Elaine, have one son and three grandchildren. Henry Brandt was a renowned author, teacher, Christian counselor, and consulting psychologist who died in 2008 at the age of 92. He was known as "The Father of Modern-Day Biblical Counseling" and in 2003 received the American Association of Christian Counselors' "Care Giver Award" for his lifetime achievements in counseling. His books include The Heart of the Problem and Marriage God's Way, an ECPA Gold Medallion Award finalist.